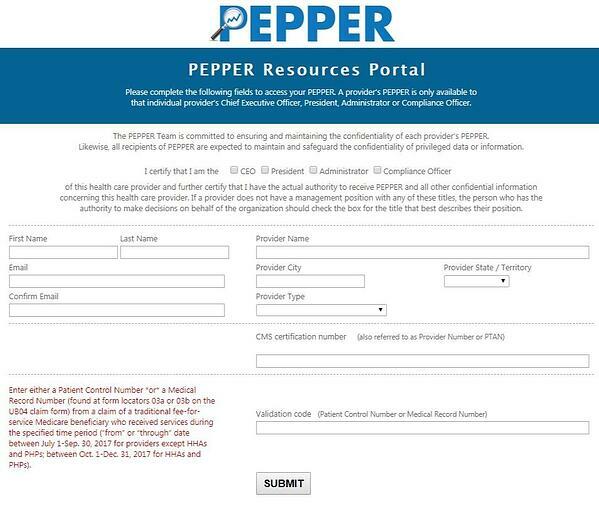 Free-standing SNFs and SNFs that are part of another type of hospital (3rd digit in the PTAN/CMS certification number/provider number = 5 or 6): Available electronically via the PEPPER Resources Portal. SNFs that are part of a Critical Access Hospital will not receive PEPPER. Enter a Validation code. The Validation code is either a Patient Control Number or Medical Record Number found at form locators 03a or 03b on the UB04 claim form of a Traditional Fee-For-Service Medicare beneficiary who received services during the specified time period. The specified time period will be the “from” or “through” date between July 1, 2018-September 30, 2018. Submit following entry of all required fields. The PEPPER will open in an EXCEL attachment. Save the attachment. Please email the PEPPER Report to Harmony Healthcare International (HHI) for completion of your Comprehensive PEPPER Analysis.